FILE - An employee at Globovision, a 24-hour television news channel, works behind a glass reading "News" with Globovision's logo "G" at the channel's headquarters in Caracas, Venezuela, Oct. 3, 2003. The United States imposed sanctions that target a Venezuelan currency exchange network scheme that siphoned off billions of dollars to corrupt insiders of the Venezuelan government, the U.S. Treasury Department said on Tuesday. The seven individuals involved include a former treasurer of Venezuela, Claudia Diaz, and television mogul Raul Gorrin, who bribed the Venezuelan Treasury in order to conduct illegal foreign exchange operations, according to the U.S. Treasury. "Venezuelan regime insiders have plundered billions of dollars from Venezuela while the Venezuelan people suffer. Treasury is targeting this currency exchange network which was another illicit scheme that the Venezuelan regime had long used to steal from its people," Secretary of the Treasury Steven Mnuchin said in a statement. The U.S. Treasury said the individuals used favorable foreign exchange transactions through brokerage firms controlled by Gorrin and were among the very few deals that were approved by Venezuela's treasury. The individuals concealed their profits in U.S. and European bank accounts and investments, it said. Reuters was unable to obtain comment from Diaz or Gorrin. Diaz is under house arrest in Spain and Gorrin could not be immediately located. 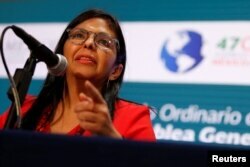 Venezuelan Vice President Delcy Rodriguez described the measures as illegal and abusive during a news conference in Caracas. FILE - Delcy Rodriguez speaks during a news conference on the sidelines of the OAS 47th General Assembly in Cancun, Mexico, June 20, 2017. "They are not sanctions, because only the (U.N.) Security Council can impose international sanctions. We're talking about arbitrary measures because they are not backed by any international law," said Rodriguez. Tuesday's measures were Washington's latest move against the government of President Nicolas Maduro, which is widely criticized for crippling the economy and undermining democracy. 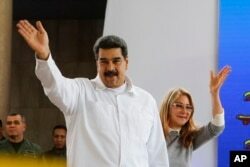 The United States imposed sanctions on Maduro's wife, Cilia Flores, in September as President Donald Trump urged members of the United Nations to support a "restoration of democracy" in the once-booming country, a member of OPEC. FILE - Venezuela's President Nicolas Maduro, left, and his wife Cilia Flores greet supporters upon their arrival to a meeting with Colombian citizens that reside in Venezuela, in Caracas, Sept. 25, 2018. The new sanctions apply to people involved in the corrupt system within Venezuela's treasury since 2008, the U.S. Treasury said. The Treasury statement cited 23 groups in the scheme, including Globovision Tele in Caracas and Miami, Magus Holdings in Miami, Tindaya Properties in New York, and Planet 2 Reaching Inc and Posh 8 Dynamic Inc, both of Delaware. Venezuela's treasurer before Diaz, Alejandro Andrade, was sentenced by a U.S. District Court in Florida in November to 10 years in prison for accepting more than $1 billion in bribes as part of the scheme. He was helped by Gorrin, owner of television station Globovision, who has been charged with paying bribes to Andrade and others as well as helping to launder the payments, according to U.S. court documents unsealed in November. The cases are part of a broad effort by U.S. prosecutors to crack down on the use of the American financial system to launder proceeds from corruption in the crisis-stricken country that is suffering from hyperinflation. Maduro has said little about criminal proceedings against former Venezuelan officials, but says the United States is seeking to undermine his government through financial sanctions. He is due to be inaugurated for his second term on Thursday.